Atlanta Williams-McDowell, Riley Little, Kristiana Whiston, Sam Keno, Alexie Phillips, Mya Lindsay and Shem Gutierrez. Following the success of the Highlanders on Saturday, we have decided to hold a blue and gold/yellow Highlanders themed mufti day tomorrow as a way of supporting our local lads as they go into their game against the Warratahs this coming Saturday. We will collect a gold coin donation to go towards our Caritas Missions fundraising efforts. There will be no mufti day on Friday 3rd July. Remember tomorrow is the last day for library books to be returned to school. There will be no canteen orders on Friday 3rd July due to the sausage sizzle. Will be held on Friday 3rd July to raise funds towards the ski transport for term 3. Order forms will go out early next week. Please return them by Wednesday 1st July. Preparations for our optional ski programme commencing in term 3 are well underway and there are over 50 children signed up to participate. Keri Robinson and Mr Cartlidge will be holding a parent ski information evening at school tonight at 7.00 pm. It will cover all aspects of the programme including safety gear, safety lessons, transport and finances. We request that if you have a child on the programme that you have at least one parent here at the meeting. If you are not able to attend, please make arrangements to speak to Mr Cartlidge asap. You can email him at pcartlidge@stjoseph.school.nz The programme will start on the first Monday of term 3 (Monday 20th July) and will run for eight weeks, weather permitting. Congratulations to Susie Jorgensen and her team of very keen gardeners who have managed to raise $60 which is being donated to St Vincent de Paul. Well done. 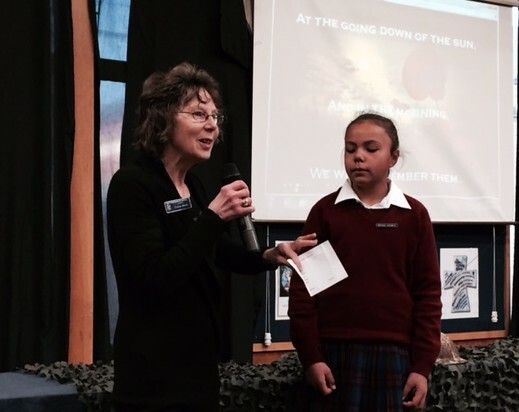 Elenoa presented the cheque to Mrs Marsh who accepted on behalf of St Vincent de Paul. Any empty toothpaste tubes and caps, toothbrushes and/or packaging, floss containers and any other oral care products. Bring them to the school office where we can send them away for rewards. Due to lack of numbers, there will be no North Otago U13 girls basketball team this year. Provides quality coaching experiences to young netballers aged 8-14 years old of all abilities. Learn the fundamentals of the game - movement, fitness, ball skills, shooting, attack, defence, tactical and technical awareness - all while having fun each week. The dates for term 3 are Friday 31st July to Friday 18th September. Costs $100 per player. Go to www.netballsouth.co.nz for more information. A holiday programme for children aged from 5 to 12 years of age. Conducted by NOCA Director of Coaching, Derek Walker. All equipment provided, great giveaways, small sided games and skill sessions with an emphasis on fun! Date: Wednesday 8th July to Friday 10th July (3 day course) or Monday 13th to Wednesday 15th July (3 day course). To enrol: email derekwalker@ihug.co.nz or phone 027 649 0000. A detailed information sheet will follow your enrolment. Hot Shots Tennis Free Racket and 5 Weeks Programme - for ages 5 to 10 years on Fridays in term 3 from 3.30 to 4.10 pm. Costs $65.00. Book online www.northotagotennis.com/coaching/ to receive free racket, limited stocks so be quick. Phone or text Steve on 027 284 9578 to reserve a place.